This is a great dish for winter, chock full of apples and raisins it’s a really tasty treat that works well with a black milky tea. 1. Using a stand mixer with a paddle attachment beat the butter and sugar together on medium speed until smooth (2 min). 2.Add the eggs and beat until light and fluffy (3 min or more). 3. Reduce the mixer speed to low and add the baking powder and salt and mix to combine. 5. Slowly add the flour (3.25 cups), making sure to scrape down the bowl regularly. The dough is meant to be soft, but you can add more flour if the consistency is more like a batter. The end product should nearly clean the edges of the bowl as it is being mixed. 6. Scrape out the dough and place it on a work surface. Divide it in half, shape each halve into a rectangle. Wrap in plastic wrap and refrigerate for at least 2 hours. 1. Peel and core the apples and cut into slices about ¼ inch thick. 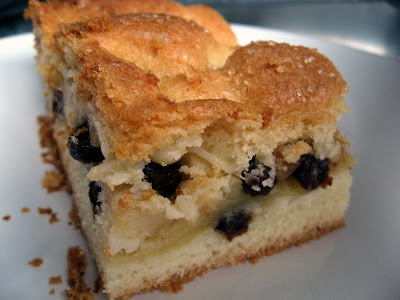 2.Toss the apples together with a little lemon juice, and add the raisins. 3. Combine the sugar and cinnamon and sprinkle over the top of the apples. Mix to coat the apples evenly with the cinnamon and sugar. 4. Taste the apples and see if you’d like to add more lemon or sugar. 1. Center a rack in the oven and heat to 375F. 2. Grease a 9x12 inch baking dish and place it on a baking sheet. 3. Remove the dough from the fridge. If it is to hard to manipulate let it sit at room temperature for 15min. 4. For the base – use half of the dough and press it into the bottom of the baking dish. 5. Spread the apple filling on top as evenly as possible. 6. Roll out the second piece of dough so that it is slightly larger then the baking pan. 7. Place the dough on top of the apples and tuck in the over hanging edges. 8. Brush the top of the dough with water and sprinkle sugar over the dough. Using a knife cut 6-8 evenly spaced slits in the dough. 9. Bake for 65-80 min until the dough is a golden brown and the juices from the apples is bubbling through the slits. 10. Place the pan on top of a wire rack, and let cool to warm or room temperature. Taken from the wonderful Dorie Greenspan “Baking from my Home to Yours” pp. 310-11.